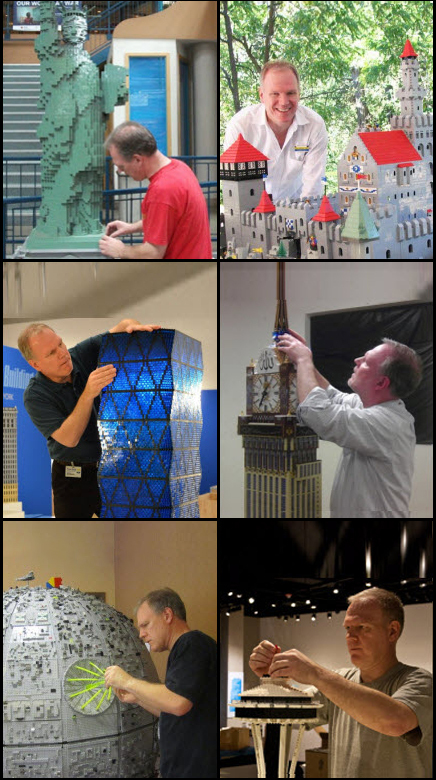 Dan Parker lego artist and associated groups have been providing custom LEGO artpieces, events, and education venues since 1996. Corporate pieces, models and entertainment for shows & events of any size, and unique organizational and workshop venues for both children and adults. Dan has produced nearly 4000 pieces ranging from miniature and mechanical to sculpture and mosaic in many themes and genre on a wide variety of subject matter. Notable pieces include a traveling skyscraper exhibit, 40,000-piece Statue of Liberty, life-size display of the Nativity, European palace, a 6-foot custom Star Wars Death Star, and a functioning burial casket. Popular works along with several specialized client models have been shown in corporate, public, and private settings to interest and engage visitors and participants.